The Election Is Tuesday, November 6. 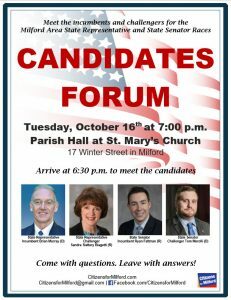 Citizens for Milford Will Host the Candidates Forum Tuesday, October 16 Featuring Incumbents and Challengers for State Representative and State Senator. All area voters are invited to attend! Citizens for Milford is organizing a Candidates Forum featuring the candidates for State Representative of the Tenth Worcester district, as well as the candidates for State Senator of the Worcester and Norfolk district. The Forum will be held Tuesday, October 16 in the Parish Hall at St. Mary’s Church in Milford. The two incumbents (State Representative Brian Murray, Democrat; and State Senator Ryan Fattman, Republican) and their respective challengers (Sandra Slattery Biagetti, Republican; and Tom Merolli, Democrat) will be available to meet voters starting at 6:30 p.m. The forum will start at 7:00 p.m. This event is free and open to the public. Constituents in all towns within the Tenth Worcester district for state representative (Hopedale, Mendon, Milford, and Medway Precinct 1) and the Worcester and Norfolk district for state senator (Bellingham, Blackstone, Douglas, Dudley, Hopedale, Mendon, Milford, Millville, Northbridge, Oxford, Southbridge, Sutton, Uxbridge, and Webster) are invited to attend. Each candidate will have the opportunity to make an opening statement, answer questions from members of the audience, then make a closing statement. Citizens for Milford Chairman Steve Trettel and Co-Chairman Jose Costa will moderate the event. Milford voters who are unable to attend the forum are encouraged to email questions in advance to CitizensforMilford@gmail.com or to submit questions via our Facebook page. The group will make every effort to ensure those questions are posed to the candidates the night of the forum. The forum will be video recorded and broadcast on Milford TV at subsequent times. The video will also be available to watch on this website and Facebook page as soon as it is available following the event. The Parish Hall of Saint Mary of the Assumption Church is located at 17 Winter Street in Milford. Parking is available in the adjacent lot and on neighborhood streets. Main entry into the Parish Hall is located on the side of the building that faces Sumner Street. Doors will open at 6:30 p.m.
Help us spread the word! Download and print a copy of the flyer. Editor’s Note: Citizens for Milford does not endorse candidates.